My search was at a standstill. Mary Ann was that inevitable brick wall faced by so many. But I was wearing blinders. These needed to be shed before I could break through what I thought to be a solid obstacle. 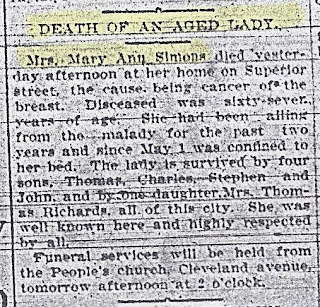 When I found Mary Ann’s short obituary, scraps of information began to take shape for me and paint a richer portrait of Mary Ann than her name, birth, marriage, and death dates ever could. I learned she had been confined to her bed since May with breast cancer. While I did not pay attention to the children’s names mentioned in the paragraph, I was beginning to consider Mary Ann’s canvas, the era in which she walked and talked, her possible friendships, family relationships, and daily routine. 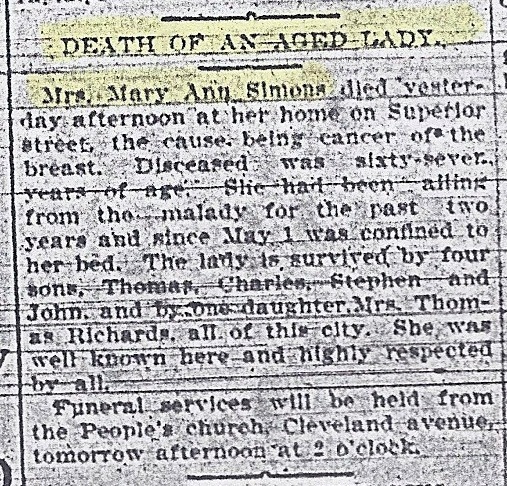 The obituary said she was “highly respected by all.” What had she done to receive that accolade? The few sentences began to stir my sense of wonder. I had never heard of the church where her funeral would be held. I had always thought this was a Methodist family. What was the People’s Church? She had been “ailing” for two years. Who had helped her? How did she manage?